Fans vote for their favorite nominee by using that player's hashtag on Twitter. Rudolph's hashtag was used nearly 470,000 times. 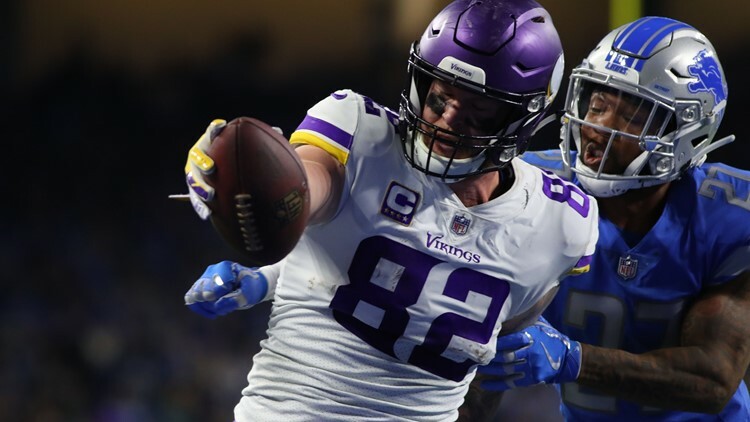 MINNEAPOLIS — Vikings tight end Kyle Rudolph has won the Walter Payton Man of the Year Charity Challenge. The annual award recognizes NFL players for their excellence on and off the field. Each NFL team nominates a player who has had a "significant positive impact on his community." Rudolph is one of 32 nominees for that award this year. The Man of the Year award was established in 1970, but the affiliated Charity Challenge has been going on only four years. Fans vote for their favorite nominee by using that player's hashtag on Twitter. Rudolph's hashtag was used nearly 470,000 times. Rudolph was announced as the winner of the Charity Challenge on Sunday. That means Nationwide, which sponsors the award, will contribute $25,000 to Rudolph's foundation, Kyle Rudolph's End Zone. The winner of the actual Man of the Year award will be announced during NFL Honors, a primetime special that airs the night before the Super Bowl. The winning player will get $250,000 donated to United Way in his name and up to $250,000 to the his charity of choice.